Got Perennials? Fall is a good time to divide and save. We have a long empty flower bed that would cost me a fortune to fill with store bought plants. I have a lot of echinacea and black eyed susans that need divided and fall is a great time to divide certain perennials. If you divide in the fall, you should do it 6-8 weeks before the first frost or the new plant’s might not survive the winter. The weather has been beautiful and sunny. It is in the mid-70’s during the day and it dips to the low 60’s at night. Perfect weather to divide over-grown perennials and replant in a new spot. My new perennial bed. I made sure to leave some room in between the plants. I have a nasty habit of planting too close together. 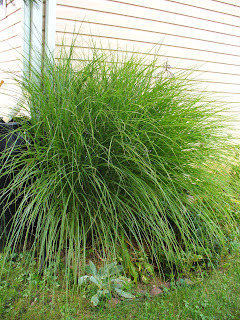 This over-grown ornamental grass is in desperate need of a thinning haircut. But I just read online that the best time to divide ornamental grass is in the spring, so I will wait. This helpful chart lists the best time to divide many perennial varieties. I figured I saved at least $30 by dividing my echinacea. If I use an average price of $5.00 for a container of echinacea (and that might be conservative) and I was able to create 6 new plants by dividing 2 plants. I will save even more in the spring when I divide the ornamental grass. This post is linked to Tightwad Tuesdays at Being Frugal and Frugal Friday at Life As Mom.